Women fitness is an important part of health. Women today are acknowledging the importance of the fit body. Fitness for women have benefits ranging from physical to emotional benefits. For the healthy and fit body, women should take care of their diet and avoid fatty foods. Proper exercise routine to strengthen muscles, lungs and heart build a fit body. In our daily life, we hear lots of women fitness tips and myths. It’s up to us either to follow these fitness tips or not, but we must know difference b/w myths and tips. 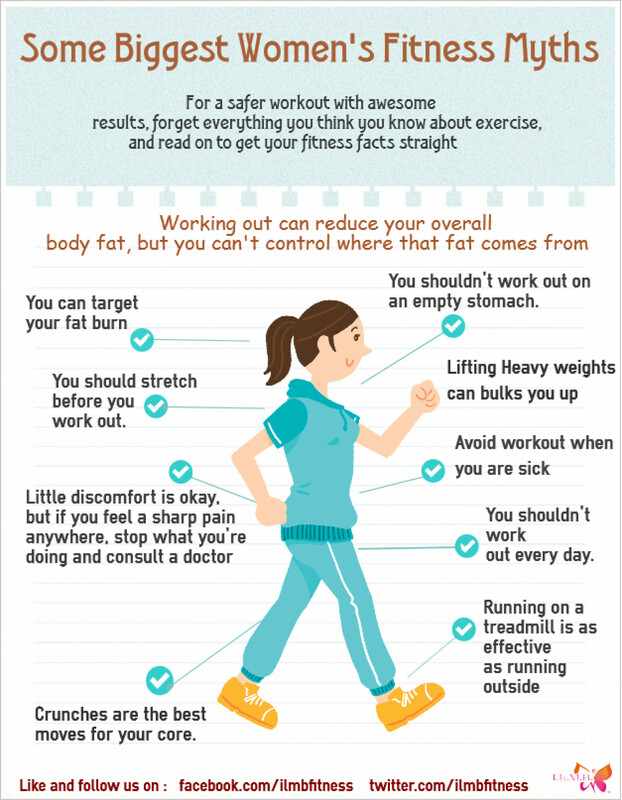 Check out the infographic below by “Ilmbfitness.com” to know more about women’s fitness myths. Here are some other common women fitness myths that we need to stop believing. Exercise can erase bad eating habits: Eating habits are based on your diet and willpower to eat the right food. I can just tone my muscles: We have lots of exercise regimes to follow for different body parts. Women need different exercises than men. You should always stretch before exercising: Not always, but yes you can go for stretch exercises when you need to focus on flexibility. I can reduce fat in one area: Yes, you can but for that, you need to follow perfect exercise for that area. Burn more fat on an empty stomach. Eat only egg whites and not the yolks. In order to be fit, having a healthy body, as in a proper diet and a regular exercise is a must. Generally, it is recommended that women should try a regular workout and be fit. Exercise could aid in staying young inside and out. Workout for beach bikini body, active body or all time shapely body with awareness of fitness facts, So put on your workout leggings and enjoy a fit life ahead!